Our range of products include co2 mig welding wire for construction machinery equipment, co2 mig welding wire for bridges, co2 mig welding wire for storage tanks, co2 mig welding wire for automobile industry, co2 mig welding wire for compressor and co2 mig welding wire for railway wagons. The offered range of CO2 MIG Welding Wire for Construction Machinery Equipment are duly tested by our experts on various quality parameter before final dispatch. A team of skilled workers and efficient labors fabricate these products. We are offering these products at industry leading prices. Venkatesh Industries is engaged in providing premium quality Co2 MIG Wires that is specially made for gas metal arc welding of mild and carbon steels. The Co2 MIG Wires offered by our company comply with the international quality standards. Venkatesh MIG wire is supplied in both winding forms in RANDOM & LAYER to get High deposition efficiency & deep penetration which helps facilitate highly efficient welding. Venkatesh MIG wires are supplied in plastic spools with a bore diameter of 50 mm which can be easily mounted on wire feeding equipment. Spools are first wrapped with Flexofilm and then shrunk to make it air tight and packed in corrugated boxes. The offered range of CO2 MIG Welding Wire for Storage Tanks such as petrol/diesel/Gas tanks are highly appreciated among our client for their best quality.These are also widely used in These wires are strong and sturdy in nature and ensure longer durability and reliability. A team of skilled workers and efficient labors fabricate these products. 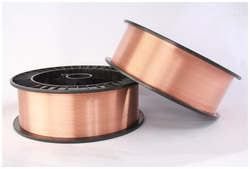 Manufacture of copper coated steel wires for MIG welding. Quality Assurance 5 every one's motto in Venkatesh Industries. In House Testing Laboratory to control Quality of the Product. Venkatesh Industries has state-of-art fully automatic manufacturing facilities which produces high/world class quality product. Venkatesh Industries 5 committed to satisfying customer needs with high quality product services. Controlled cast and Helix for smooth wire feeding. Bright S Smooth copper coating. We are offering CO2 MIG Welding Wire for Automobile Industry used for Automobile Body, Automobile Silencers, Cycle spare parts & accessories, these are available at very reasonable price in market. With the assistance of skilled and dedicated professionals we are able to cater diverse requirements of the clients. Furthermore, we offer them with customized solutions. 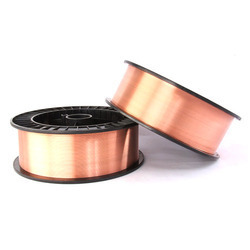 CO2 MIG Welding Wire For Compressor are manufactured from high grade quality material. 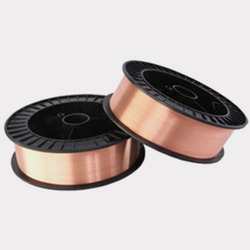 Coated with thin and uniform copper, in order to offer continuous welding, these wires find their usage in varied industrial applications. These are available at very reasonable prices. Venkatesh Industries offering wide range of qualitative CO2 MIG Welding Wire for Railway Wagons. Available with us at industry leading prices, these welding wires offered by us are widely used in various industrial applications for use in several welding purposes. We are Offering CO2 MIG Welding Wire for Steel Fabrications. We are offering qualitative range of CO2 MIG Welding Wire for Steel Furniture. These are known for their unmatched quality and unbeatable price in market. Manufactured in accordance with the existing industry guidelines, these wires are used for welding applications. CO2 MIG Welding Wire For Ships offered by us are highly in demand for their unmatched quality and unbeatable price. Excellent Welding Wire characteristics Minimum spatter and stable arc under optimum welding condition. These are available at very reasonable prices. We Are Offering CO2 MIG Welding Wire. Looking for CO2 MIG Welding Wire ?